Manual FOREX trading may be fun, but it requires enormous concentration, and is generally considered to be stressful for many traders. Manual FOREX trading is easy at the beginning, but hard every time you decide to trade. On the other hand, automated FOREX trading is least stressful on daily basis, but involves tons of efforts at the beginning, when you develop a robot that will trade for you. 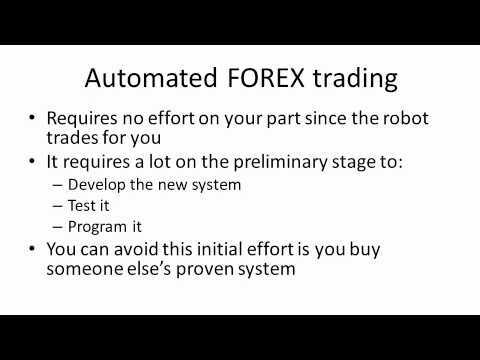 But the beauty of automated FOREX trading is in that fact that once you develop, test and tune your strategy up, the robot frees up your hands. You can go for a vocation, do whatever you like to do while your robot is making money for you. Of course you need to check your robot every day, to make sure it is working as it is supposed to, but the amount of attention it requires is substantially less. Automated FOREX trading also reduces stress associated with trading. Robot does not care about money and what you can buy using them. It cares about numbers only! It opens and closes positions according to the pre-programmed rules, and always follows them no matter what. If you like the idea of automated FOREX trading, you can develop an expert adviser for MetaTrader that will trade for you automatically. Or, you can use someone else’s proven robot by subscribing to FOREX signals. If you need more information on automated FOREX trading, subscribe to my list by entering your name and email address and pressing the orange button in the right sidebar.